World War II Veteran Vito Scaletta, the son of Sicilian immigrants, returns home from the war to find his family deep in debt, and doesn’t get involved in anything Italian to become a made man, because there are no Italians in the game at all. Or perhaps Scaletta himself doesn’t exist, if UNICO would like him taken out also, on the grounds of being a blood-relative of Sicilians. Never mind that it would be pretty peculiar to have an American city with no Italian presence, I’m guessing that the story might lack a little impact in and of itself; being that it is, you know, a story about an Italian crime family. It’d make for a lot of empty suits. Literally. UNICO’s happy if the game gets released (for example) with Chinese/Chinese-American Tongs, or the Russian Bratva, or any other racial group, because they only feel like the story is racist if the mobsters of the 1950’s America are portrayed as Italian/Italian-American? Way to go on the double-standards there. Or does the crime-family have to be one of those egalitarian and multi-racial crime-families that happened all the time in 1940s and 1950s? Maybe they can all join hands and talk about their feelings during quiet times, like all of the most interesting criminal syndicates traditionally have. As for the “targeted audience of young people”, I’m guessing they mean the audience of 17-45 year olds who form the primary target market for the game. There’s a number of films in a similar vein in production and pre-production at the moment. Why not try to stop those as well – or at least try to prevent any Italian or Italian-American portrayals in them? 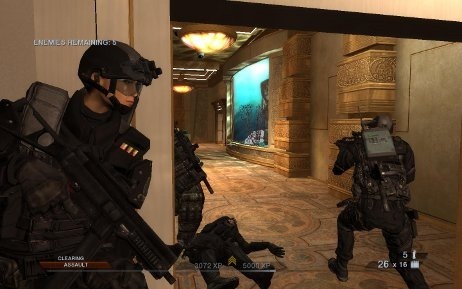 Let me now draw your attention to 2006, and Rainbow Six: Las Vegas; a story about an fictional elite anti-terrorist team who battle against fictional terrorists who stage a series of fictional attacks in a fictional story primarily set in and around Las Vegas. Las Vegas Mayor, Oscar Goodman, who wanted to take legal action against the game to get it stopped, on the grounds that the fictional story was “based on a false premise” and that Las Vegas actually a very safe place to be, as if he believed that people (other than himself, of course) had trouble discerning the difference between reality and fiction. 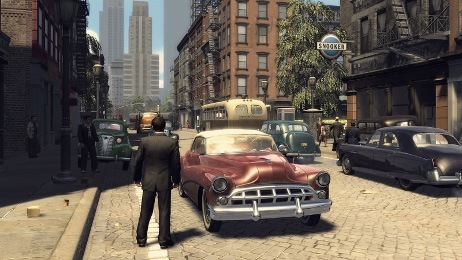 Concerned that a fictional story featuring terrorism in Las Vegas would damage the city economically, Goodman urged the Las Vegas Convention and Visitors Authority to scour the game for any item of copyright or trademark or indeed anything with which to form the legal basis of a case to get the game stopped, apparently feeling that the game might not be subject to First Amendment protection, because he didn’t approve of it. At the end of the day, I’m actually more concerned about the unhealthy attitudes of the people and organisations who are trying to get these games stopped, than I am about the games themselves (or, for that matter, the books, the television programmes, and the movies). I mean, really… If you create like… anything… will I have to check in with all the people whose butts feelings might potentially be hurt from what I do? And why the hell do they run crying to their mommies lawyers, just do dig out the old “copyright” banhammer. I hate it. I hate the whole attitude, and I hate that laws get misused to further petty ambitions. Well, at least now I know there’s an organization for italian americans. Other than the mafia, that is. ever think its those movies/books/ and games that created the unhealthy culture /attitudes of those people youre complaining about? since Ill bet they too are 17-45. As an Italian myself, I’m offended by the UNICO’s statements and request, that I don’t share at all.